Have you been following along with our mood board series on Facebook and Instagram? It all started with a questionnaire to find out what gets NBers’ creative juices flowing. The results are in, and we got a glimpse into each person’s creative aesthetic, learning about their music interests, favorite patterns, and how they define creativity. Even more important, throughout this process of self-discovery, we’ve discovered ways to better serve our clients. Hel-lo, sunshine! Meet Allie, one of NB’s project management dynamos. 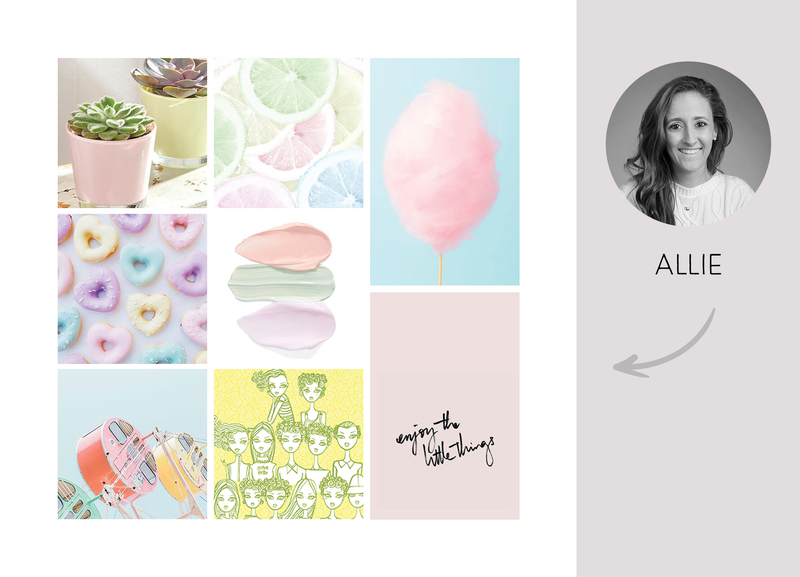 Allie’s mood board is bright and cheery, just like her! She describes her creative aesthetic as airy, whimsical, and playful. 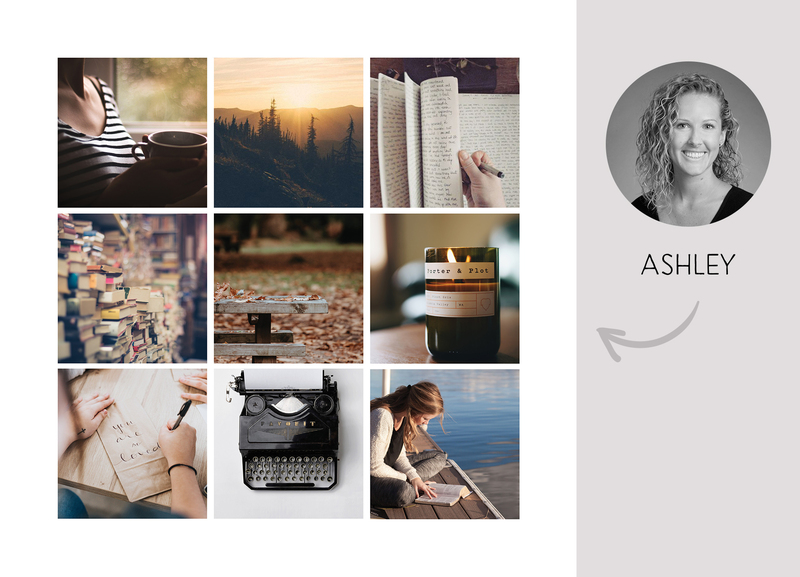 Ashley starts each morning with quiet journaling, loves to inhale the smell of bookstores, and reels in creative inspiration watching the sunset on the wooden dock at her family’s lake house. 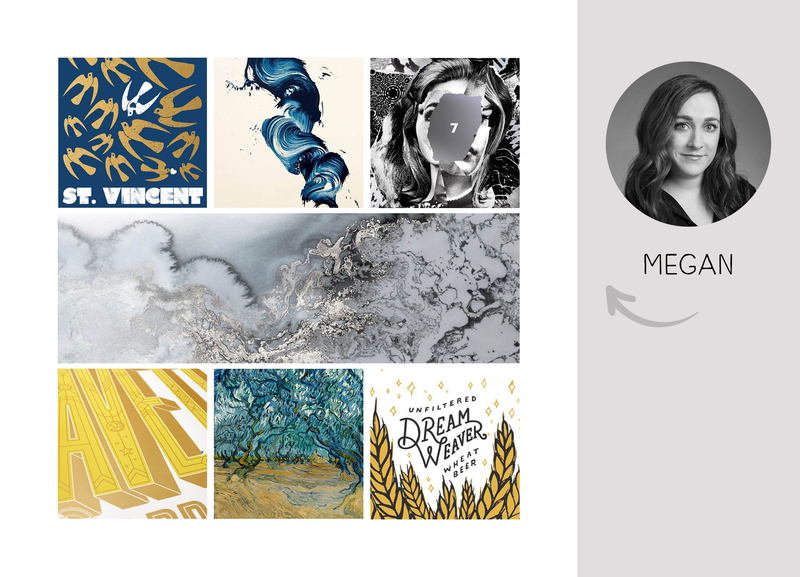 Her mood board tells the story of her creative aesthetic: thoughtful, slow, and calm. 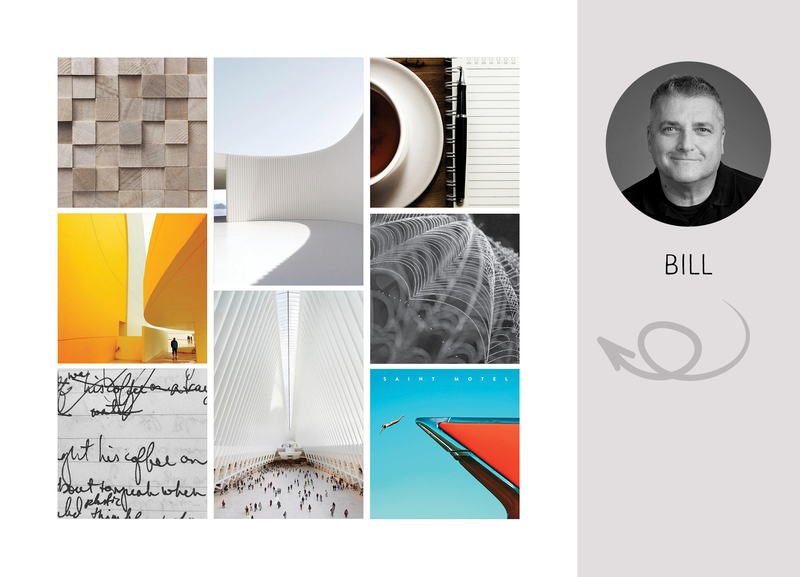 Bill’s mood board is reflective of his approach to trade shows and events, where thoughtful, strategic planning results in high-impact, inspiring spaces. With clean lines and a fresh color palette, his mood board has a modern, architectural influence, complemented by organic accents and warm pops of color. 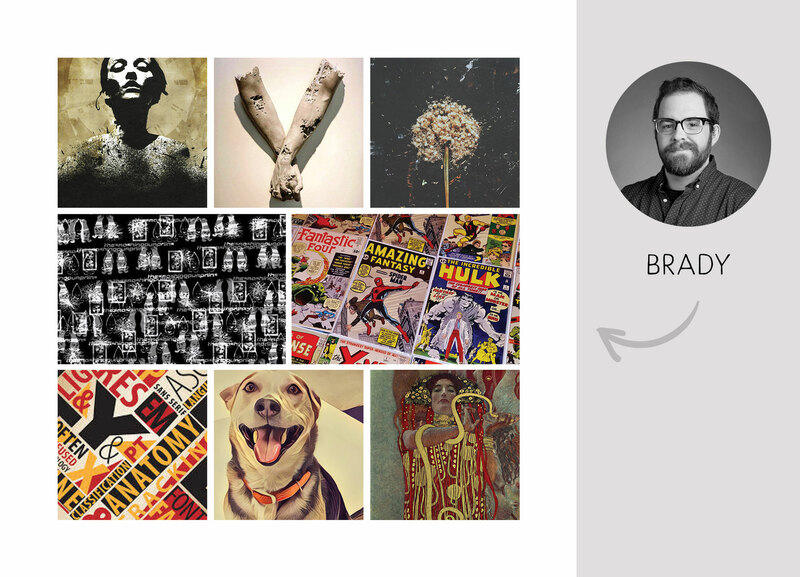 Brady draws creative inspiration from pop culture, music, and 90s nostalgia—and his bold mood board definitely reflects this vintage-yet-edgy vibe. 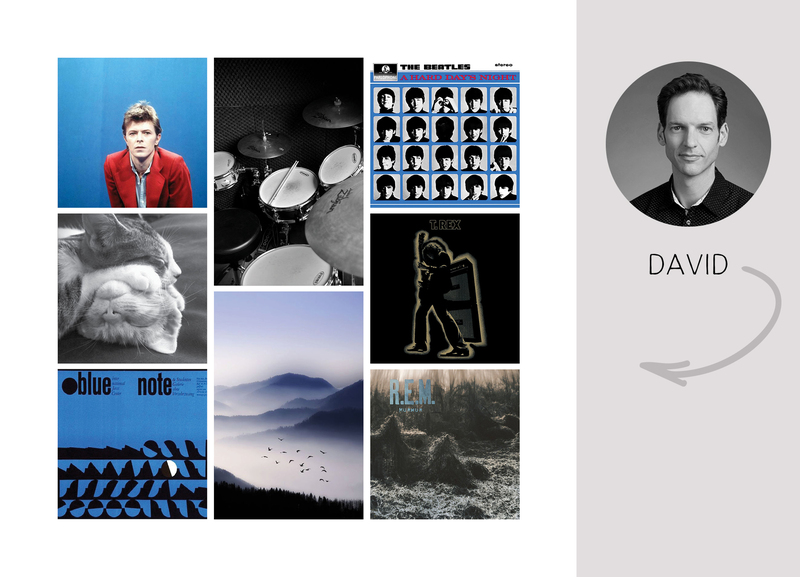 David is inspired by natural textures and patterns as well as unexpected juxtapositions that come together in harmony, describing his creative aesthetic as “ordered.” With music as his creative outlet—both playing and listening—David defines creativity as making something out of nothing, or combining unlike things into something cohesive. Meet Dawn, the self-declared “crazy dog lady” who loves to photograph her fur babies. She finds her creative inspiration from home makeover TV shows for her own shabby-chic projects around her house. 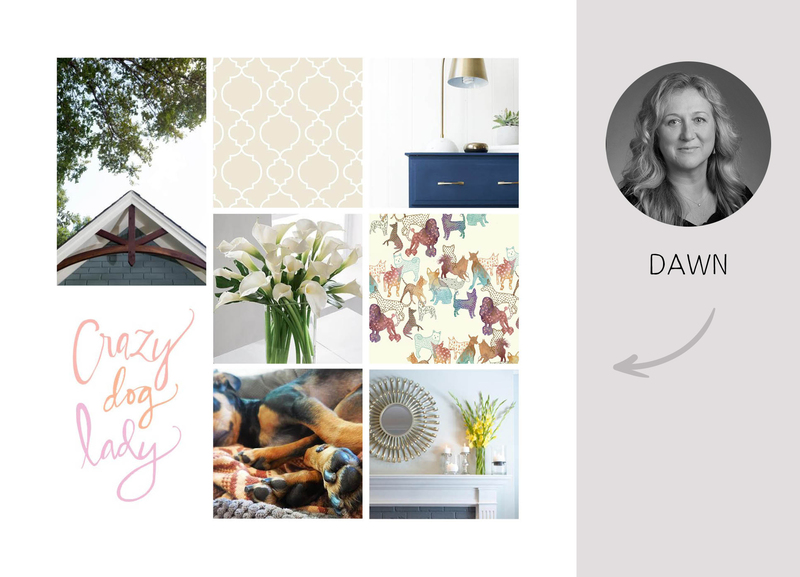 Her mood board sets her current tone: bright, simple, and minimal. Maureen is our queen of event logistics and management! 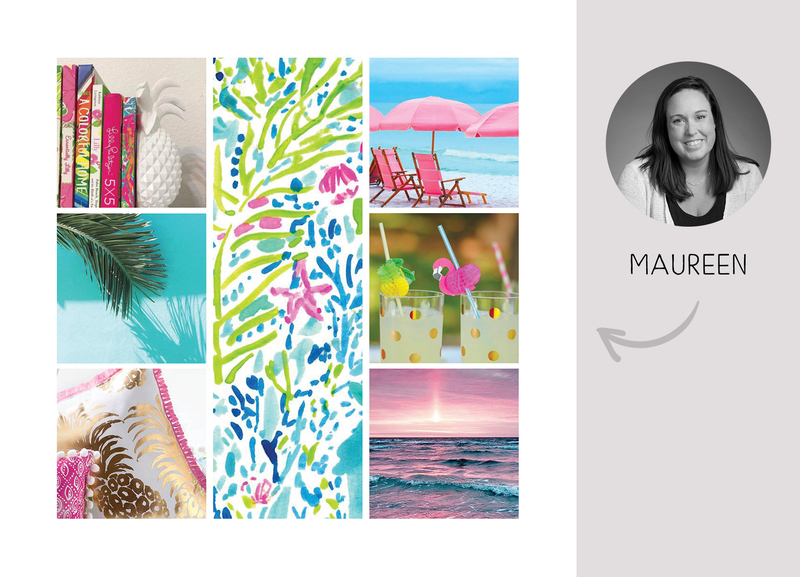 Reminiscent of warm breezes and gentle waves, this cheerful mood board is a little bit fun, a little bit relaxing…which is pretty much Maureen’s style (and her fave getaway)! Designer extraordinaire Megan, the artist behind NB’s mood board series, finds her aesthetic rooted in a minimalist, geometric, and harmonious foundation. These days, she’s gravitating toward street art, hand lettering, and stormy colors. True to his role as NB’s crackerjack 3D designer, Patrick describes his aesthetic as dimensional. 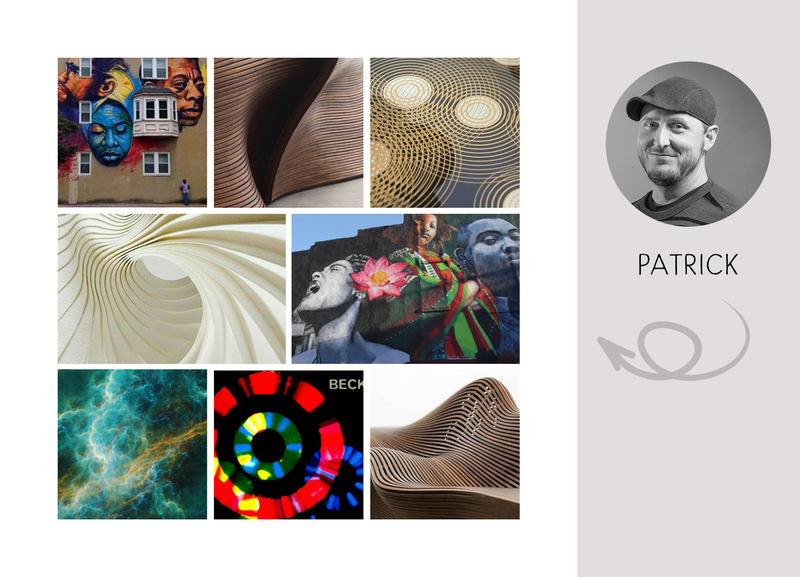 His mood board conveys his creative outlook and inspirations with organic movement, geometric elements, and light variation—also evident in his favorite city murals. 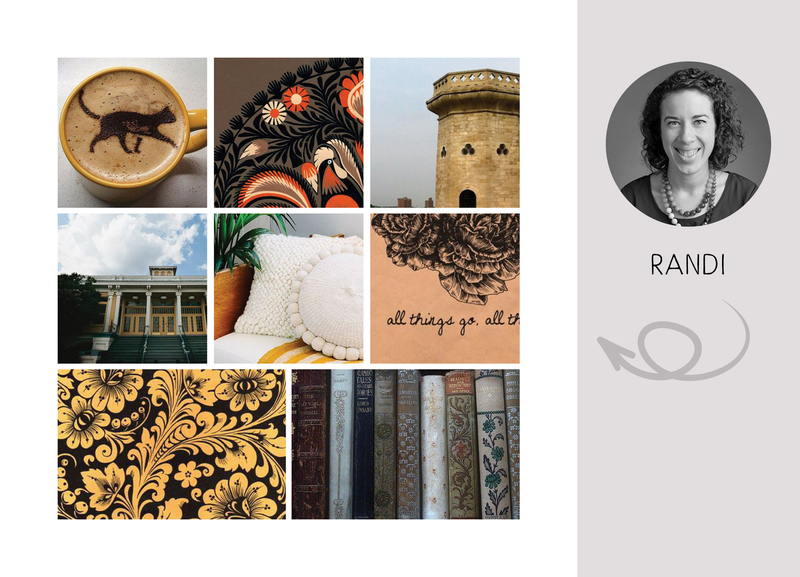 Randi’s cozy mood board integrates her love of literature, folksy Russian patterns, cats, and running in the most beautiful park in Baltimore (Druid Hill, obviously). The warm mustard tones and earthy floral patterns evoke her penchant for curling up in front of a fire on a fall evening with a good book. 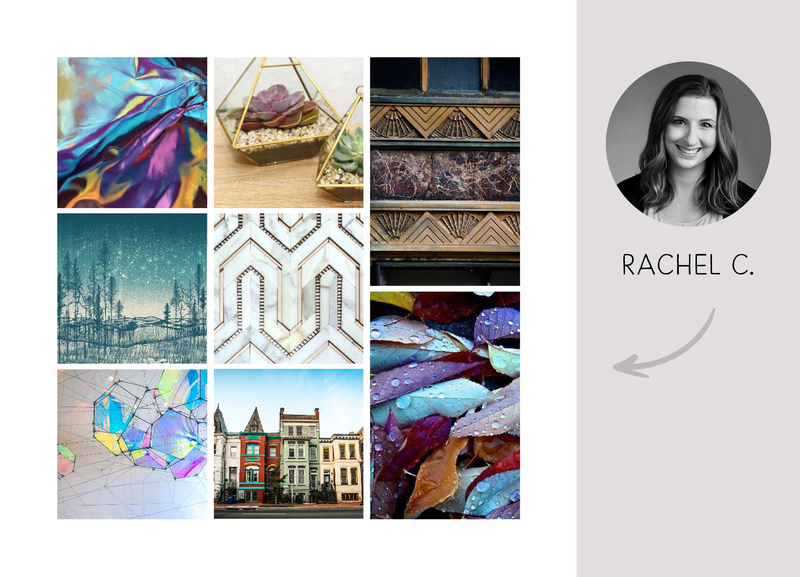 The jewel undertones of Rachel’s organic-meets-industrial mood board suit this succulent-growing guru with a flair for geometric designs. From mid-century bohemian to all the velvet, Rachel’s tastes span the decades with bold colors and sharp lines front and center. 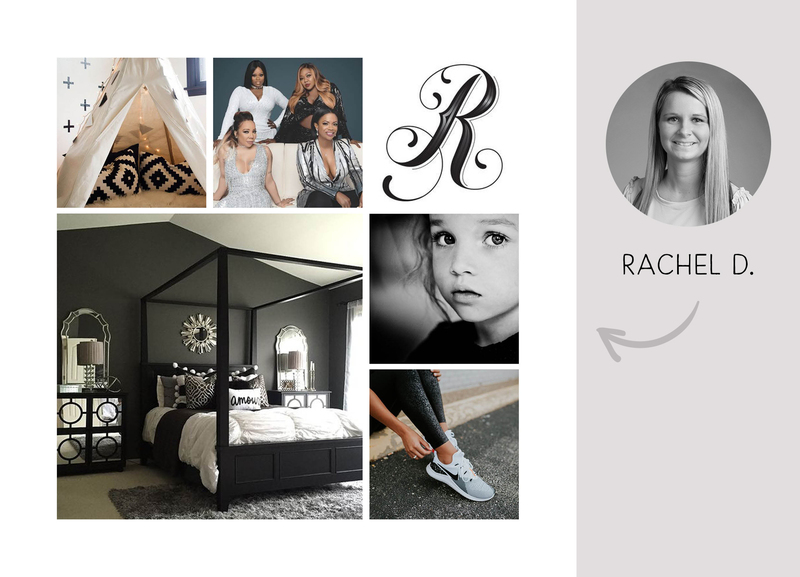 Rachel D.’s creative aesthetic is bold and energetic, with a few glam accents for good measure. She’s passionate about 90s R&B, DIY projects, and her children. In his hands-on role as the company’s leader, Steve loves working in 3D. Word walls, woodworking, vintage cars, these are a few of his favorite things. The pops of color in Herbert Bayer’s iconic 1940 artwork inspired Steve early on in his career, while the metallic details and geometric patterns define his current aesthetic. 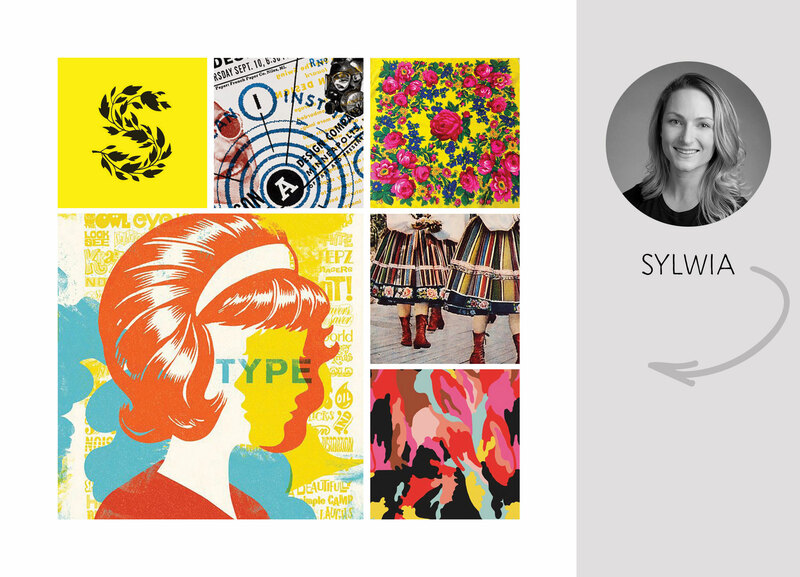 Influenced by the rich, not-so-subtle work of her favorite designer, #csadesign, Sylwia’s mood board refuses to be ignored, with eye-catching patterns, floral designs, and bright, saturated colors that are bold yet inviting. Sylwia’s talents range from oil painting to playing the piano, and she is inspired by “everydayness” and things both old and new, like Polish folk patterns and geometric patterns. 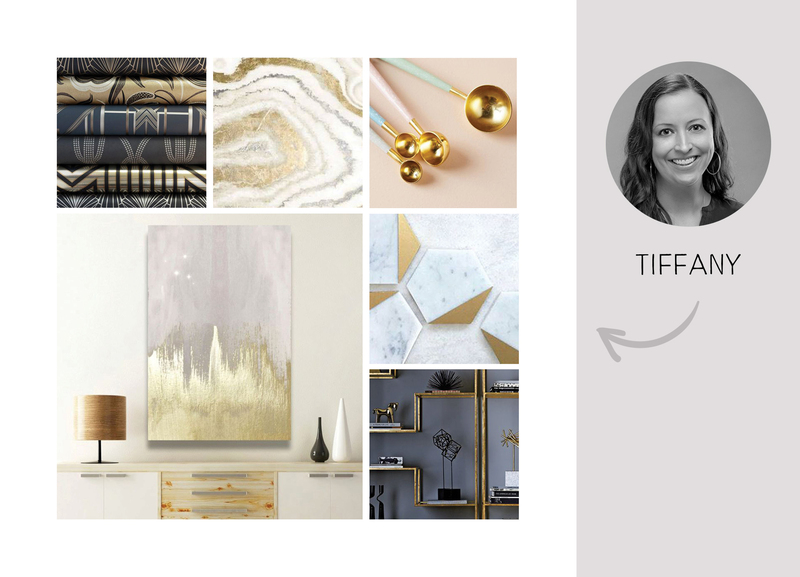 Tiffany’s creative aesthetic can be described as balanced, with smooth lines and luxe accents—especially evident in her love of interior design and fashion. So, what’s the lesson in these picturesque compilations? We learned that the definition of creativity varies among a creative director, an events manager, an account manager, a designer, and a writer, and that there is a link between our individual roles and our personal definition of creativity. We also learned we’re truly an eclectic team (OK, maybe we knew that already!). But our most important takeaway was how our diverse capabilities and approaches to creativity allow us to serve our clients in unique ways. Researching, designing, and presenting a family of images and colors lets us capture the spirit of a client’s project in a space that allows them to emotionally connect to the mood board. This connection can lay the foundation for the remainder of the design, if executed correctly. We love using mood boards to develop and hone our creative vision for a new brand identity, campaign, or exhibit space. 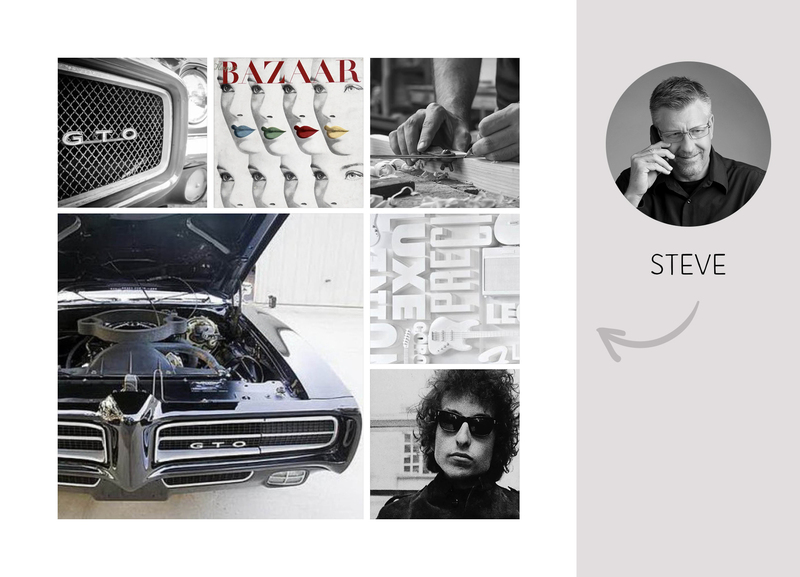 Now that you’ve gotten to know us through our mood boards, we’re ready to design yours. Want to get started on your next masterpiece?